Celebrate Easter at Harvey's with our famous Easter Brunch Buffet! Click here to learn more! Please note that if you are coming to Union Station to join us at Harvey's at a time where there is event parking in place, you will need to let the attendant know of your plans so you can get the proper ticket for validation. Stay connected to receive special offers and updates! We would love to see your group at Harvey's! Reservations for parties of any size are accepted. Please email contactus@harveyskc.com or call 816.460.2274 to make a reservation for your group. We also utilize call ahead seating. Please call 816.460.2274 to place your name on our call ahead seating list. Additionally, you can use our NoWait app to get your party of less than 12 on the list as well! Harvey's at Union Station is a charming open-air restaurant situated at the heart of the Grand Hall in Union Station Kansas City. Harvey's offers a wonderful menu with a variety of selections! From Soups & Starters to Grilled Burgers & Chicken, plus Sandwiches & Salads and don't forget Desserts too! 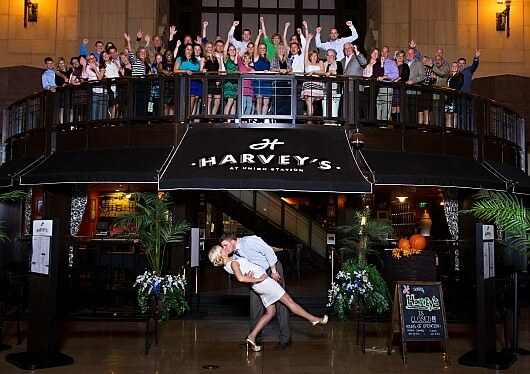 Harvey's is a charming open-air restaurant situated at the heart of the Grand Hall in Union Station Kansas City. As a public building, your reservation of Harvey's is contained to the restaurant only and does not include any surrounding space. Spaces surrounding Harvey's, including the Festival Plaza, are available for rent. The potential for other events held simultaneously to yours does exists. Since Brancato's only manages the reservations for Harvey's, we do not always know if another event is being held in the Station or will be booked, but we try our best to notify you if we become aware..